Dr. K. Lam Straight Talk: Life altering ankle sprain why you should see a doctor. Life altering ankle sprain why you should see a doctor. Active tennis coach who took a wrong step and twisted his ankle on the court while teaching about 4 months ago, ankle never felt better and in fact worsened and also feels unstable on this ankle. Pain, burning sensation noted about the outside ankle bone. MRI notes tears in both tendons on the outside as well as 2 ligament tears. There are 3 ligaments on the outside of the ankle the Anterior TaloFibular Ligament (ATFL), Calcaneal Fibular Ligament (CFL) and the Posterior TaloFibular Ligament (PTFL) as well as 2 tendons the Peroneus Brevis and the Peroneus Longus tendon. Most people will shrug off an ankle twist and think that if they can still put weight on the foot, they are fine, just a sprain. This is just one of the complications of a neglected "ankle sprain." In fact, often ankle fracture are less painful than a ligament tear. There are also discussions with new imaging technology that even those injuries classified as sprains are actually mini ruptures of the ankle ligaments. Repeated injury can cause lengthening of the ligaments and predispose a person to more injury in the future if significant injury has not already been done. Back to this case: This person injured tore two of the 3 lateral ankle ligaments, then the two tendons were injured in the same accident. Bracing and therapy would not help in this situation though was suggested by the insurance company and the independant far from caring reviewing orthopedic surgeon hired by the insurance company to deny MRI's and surgeries. Orthopedic surgeon or podiatrists are hired to do reviews of these cases to first deny MRI's and then to deny surgeries. Acting as a patient advocate in this case and many calls made, finally an MRI and surgery was done, the orthopedic surgeon's callus opinion was overturned by a case manager. 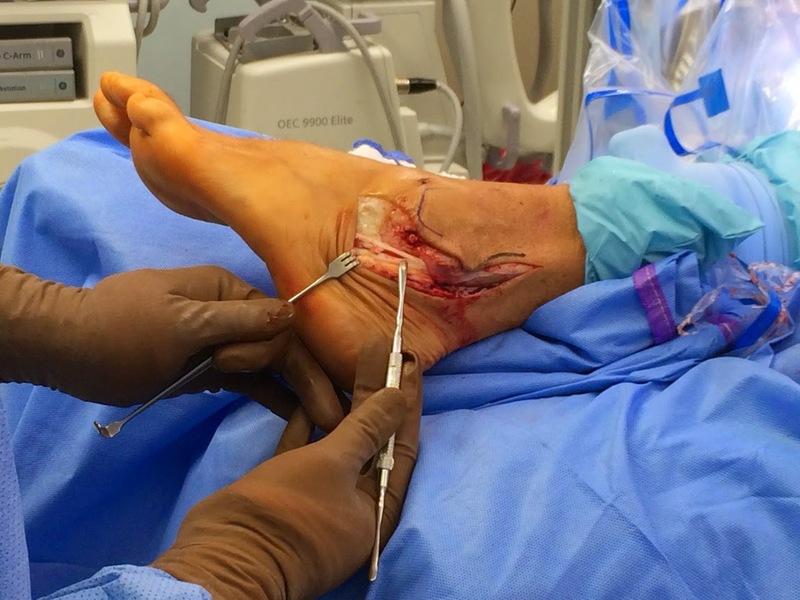 Surgery involved arthroscopy of the ankle joint to assess the cartilage and remove any inflammed tissue in the ankle, patient did have an anterior lateral impingement syndrome that was cleared with arthroscopic tools through a 4mm portal. Both tendons repaired, bone removed from the outside of the heel bone, the peroneal tubercle is a natural occurring structure but in this case worsened his situation. 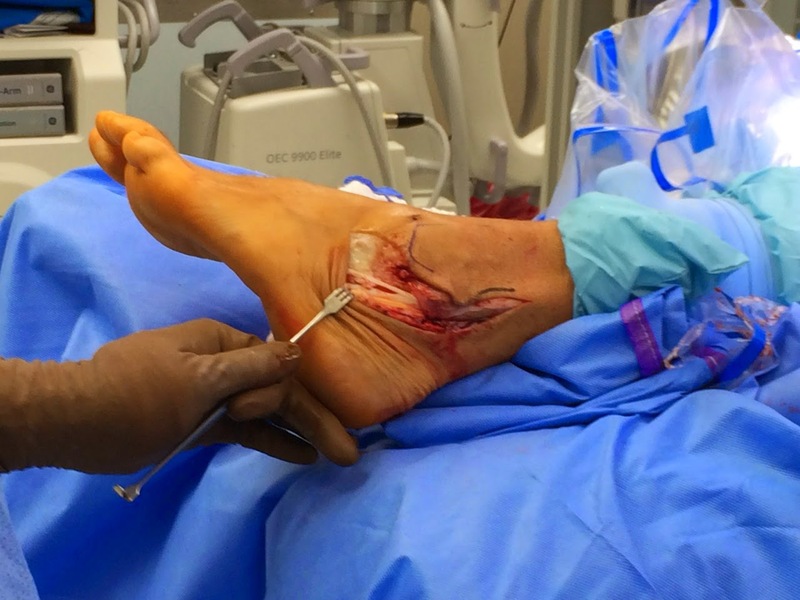 New ankle ligaments were made for this patient with his native tissue, yes, we can make new ankle ligaments. Silver retractor points at the Peroneus Longus tendon that is scarred to wall of heel bone. Brass colored retractor on the Peroneus Brevis tendon, notice the bulbus tear just to the right of the retractor. Same issue as above with instrument pointing at the peroneus brevis tear.